Spaghetti Aglio e Olio with Shrimp - super easy and delicious spaghetti with garlic, olive oil, shrimp and red pepper flakes. Amazing dinner for the family. On weekends, we would always go out to eat. Weekends are my kitchen day off, unless little G requested for home-cooked meals. This past weekend was one of those rare weekends when he requested me to cook for him. He didn’t want to go out for dinner. When I asked him what he wanted, I already knew what he was going to say…pasta. 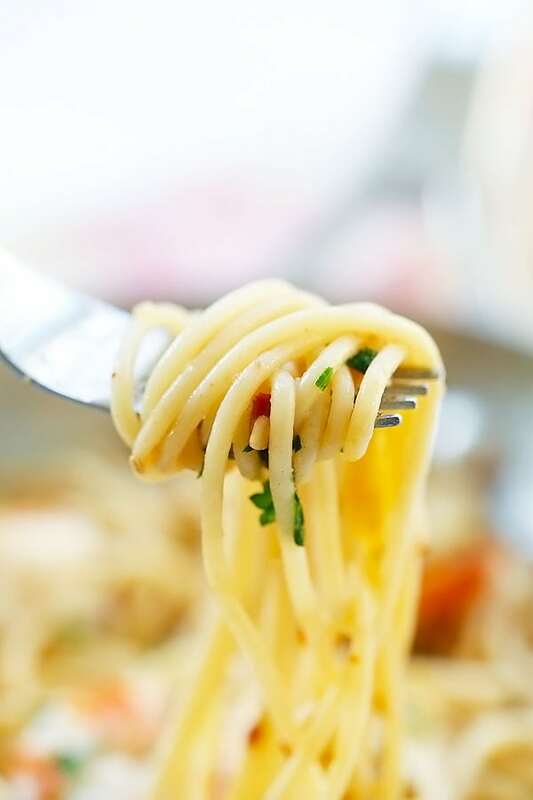 His favorite pasta is parmesan garlic noodles or Asian-style garlic noodles. To be honest, we are sick of eating the same old pasta that he would eat three times a week, so I decided to heat things up (for us) and make the spaghetti aglio e oilio with shrimp. He still got his favorite pasta, sans the chili flakes, and we got to eat something different and interesting. It worked out for the family. 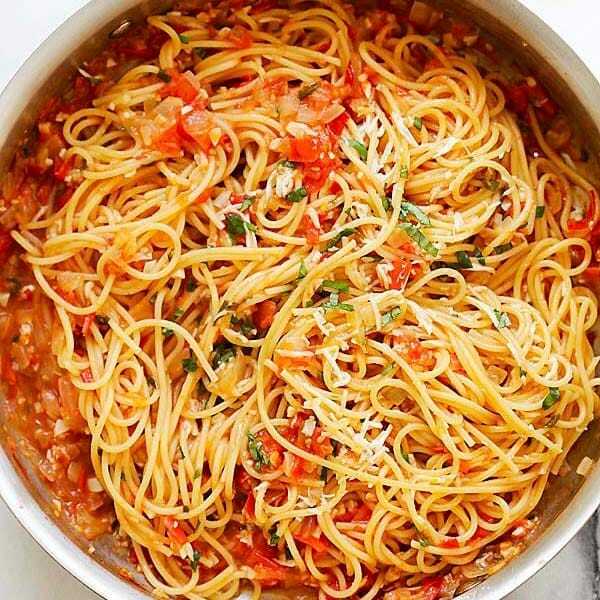 Spaghetti aglio e olio is one of the most basic and easiest Italian recipes. As the name suggested, it’s made with garlic (aglio) and oil (olio). The oil is olive oil, and all spaghetti aglio e olio is speckled with chili flakes, which gives the pasta a subtle heat factor, plus jazzing up the taste department. 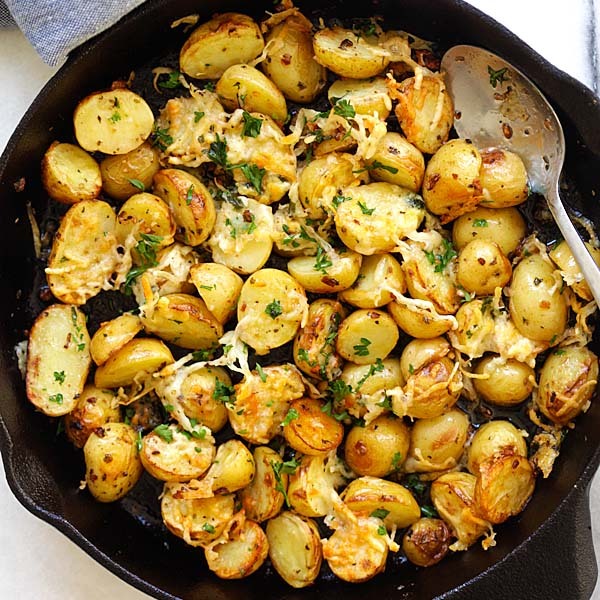 It’s amazing how the entire dish is transformed because of the addition of chili flakes. I don’t like plain pasta and would always make them with either clams as in linguine alle vongole, or my favorite shrimp. 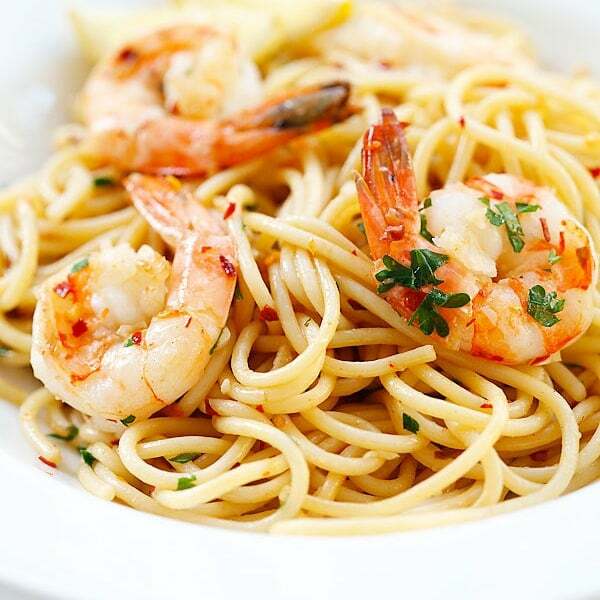 You can never go wrong with a few plump, fresh, and juicy shrimp on your pasta. I opted for tiger prawn but you can use regular shrimp. The end result was this amazing spaghetti aglio e olio, and we all had a wonderful weekend dinner. Mr. Rasa Malaysia and I had the spicy version, with wine, and little G got his fix of pasta. Everyone was happy! 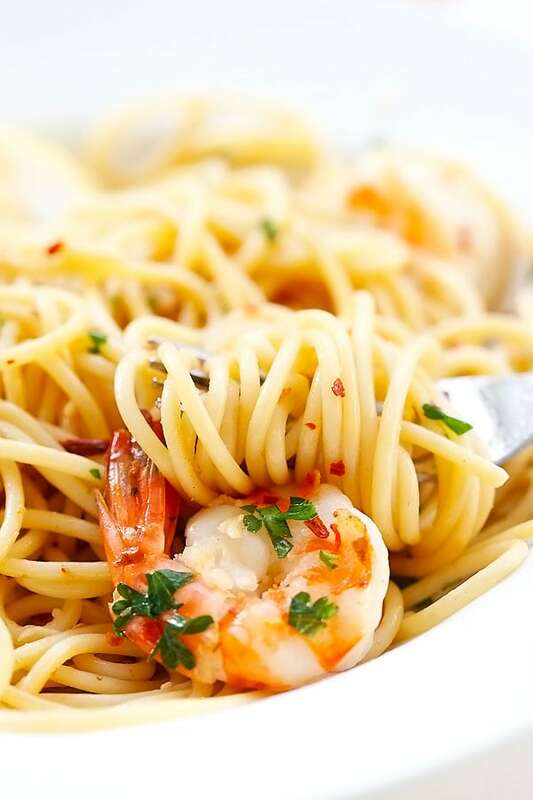 Try this amazing Spaghetti Aglio e Olio with Shrimp recipe, I am sure you and your entire family will really enjoy it. 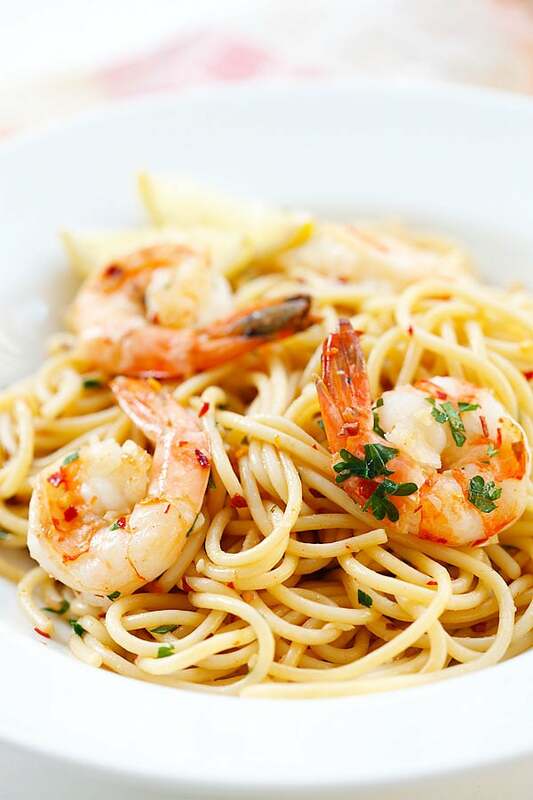 Spaghetti Aglio e Olio with Shrimp – super easy and delicious spaghetti with garlic, olive oil, shrimp and red pepper flakes. Amazing dinner for the family! Bring a pot of water to boil. Cook the spaghetti according to the package instructions. Drain and set aside. Save 3 tablespoons of the pasta water. Heat a skillet on medium heat and add the olive oil. Add the garlic and saute for 30 seconds, add the shrimp, chili flakes, and salt. Cook the shrimp until both sides turn white, then add add the spaghetti and water into the skillet. Stir to combine well. Add the parsley into the skillet, stir to distribute well. 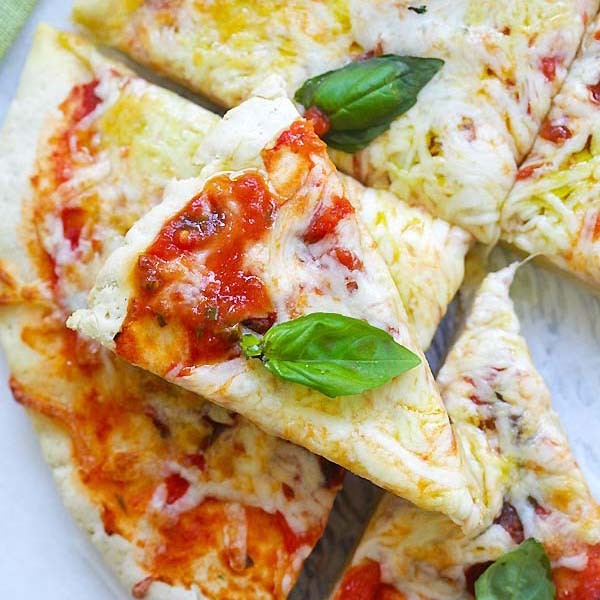 Turn off the heat and add the Parmesan cheese. All photos and recipes on Rasa Malaysia are copyright protected. Please do not use the photos and recipes without prior written permission. If you wish to republish this recipe, please rewrite the recipe in your own words instead of copy and paste and link back to //rasamalaysia.com/spaghetti-aglio-e-olio-with-shrimp/. Thank you very much! 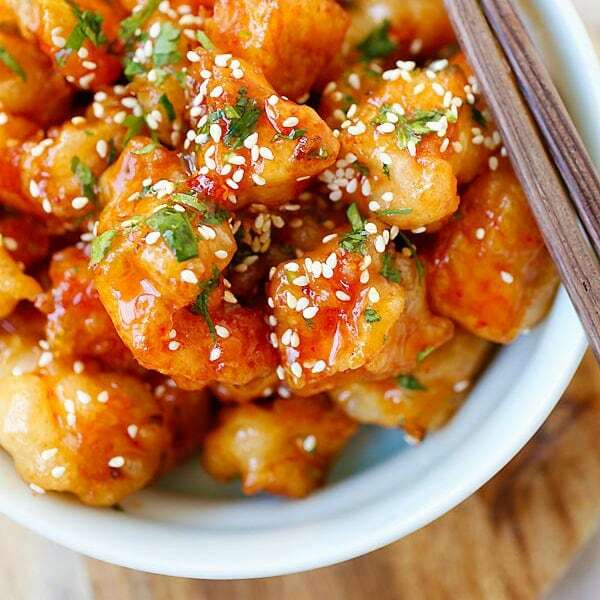 Its looks so yummy….!!! The combination of Spaghetti and Shrimp is really awesome. Just love it….!! A suggestion, try adding some anchovy filets to the warmed oil, they will break down and dissolve into the sauce. 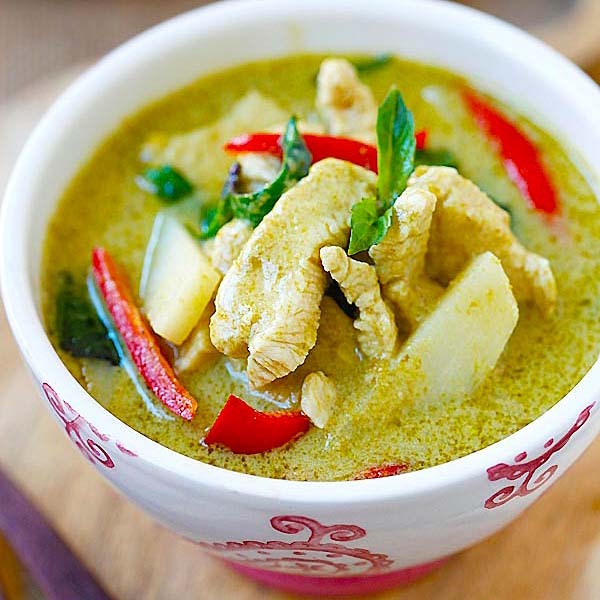 This will provide the Umami effect of asian dishes and deepens the flavor. Also, allow a little more time for the garlic to flavor the oil, or mince it very fine. Another similar Italian dish is made just with anchovies and oil, no garlic. Usually oil based pasta dishes are made with extremely fine macaroni, Angel Hair or Fidellini. I tried this recipe for our dinner and it come out so lovely. Thanks for sharing bee. Thanks Tonette for your sweet comment. Glad that you liked this spaghetti aglio e olio recipe. I can’t get the red pepper chilli flakes. Is paprika flakes the same? Paprika is spicier but you can try. Well, thanks goodness I came across of your old post…. the Spaghetti Aglio e Olio with Shrimp! I love pastas and shrimps!!! 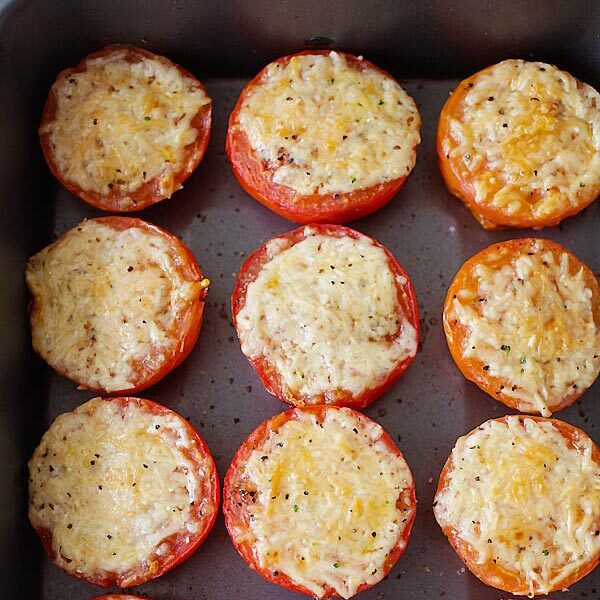 This recipe sounded fabulous. 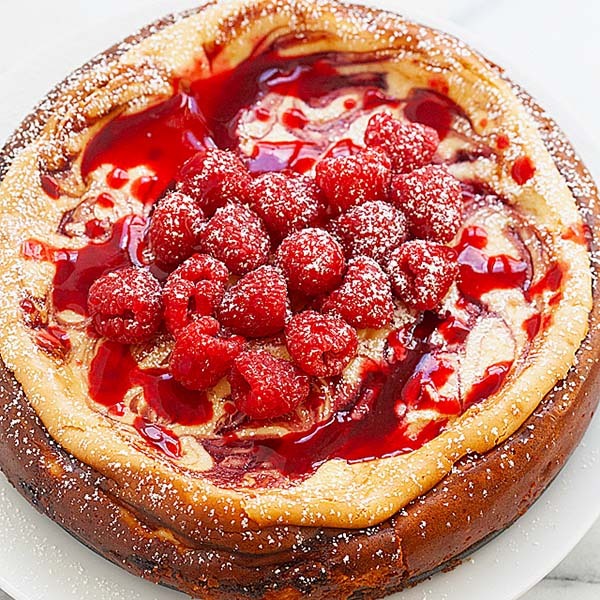 So tonight I’m gonna be making this.By the way I checked out your of all other recipesand OMG your recipes are killing me…Lol, all look so delicious. I will try them soon. 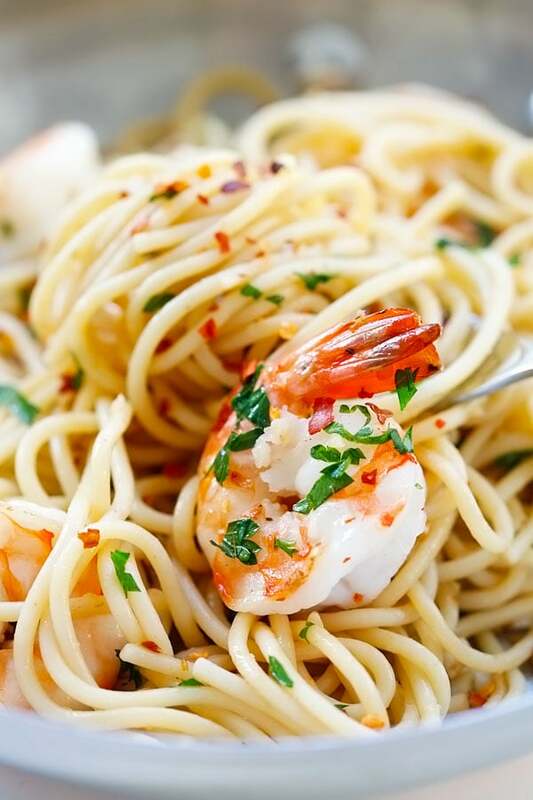 Awesome, I am happy that you love my spaghetti aglio e olio with shrimp. I really loved your pinterest recipes but now your posts are completely bombarded with advertisements. Please add a feature where you can go straight to the recipe. also this recipe is for Korean wings not sphaghetti with shrimp. An error has occurred with your feed.